Fabian socialism is a type of socialism founded in 1884 in London. It sought use of the democratic framework to achieve gradual conversion to socialism. This approach originated from the movement for utopian socialism. Its nine founding members were Frank Podmore, Edward R. Pease, William Clarke, Hubert Bland, Percival Chubb, Frederick Keddell, Henry Hyde Champion, Edith Nesbit, and Rosamund Dale Owen. Havelock Ellis is sometimes also mentioned as a tenth founding member, though there is some question about this. Important Fabians includes George Bernard Shaw, Beatrice and Sidney Webb, Annie Besant, and Bertrand Russell. The Fabians were influential in forming the ideas of the British Labour Party. They advocated the ideal of a scientifically planned society and supported the eugenics by way of sterilization. The Fabian Society is generally regarded as a derivative of a group "Fellowship of the New Life", though there is some disagreement about this. The Society derives its name from Fabius Maximus, a Roman general known for his delaying tactics. This was at the suggestion of Frank Podmore. The Fabian Society aims at the reorganization of Society by the emancipation of Land and industrial Capital from individual and class ownership, and the vesting of them in the community for the general benefit. In this way only can the natural and acquired advantages of the country be equitably shared by the whole people. The Society accordingly works for the extinction of private property in land and of the consequent individual appropriation, in the form of Rent, of the price paid for permission to use the earth, as well as for the advantages of superior soils and sites. Ideologically, Fabians are quite different than other brands of socialism. Fabian socialists prefer evolutionary tactics over revolutionary tactics. This is a direct rejection of one of the most important parts of Marxism. This is seen with their choice of name; being named after Roman General Fabius, who preferred tactics of harassment and wearing down his enemies rather than directly engaging with them. This is also seen in their choice of mascot: the tortoise. One iteration of the Fabian tortoise contains the inscription When I strike, I strike hard. The Fabian preference for evolutionary socialism (achieving full socialism in multiple stages instead of one stage) is also reiterated in a summary slogan which was coined by Sidney Webb: The Inevitability of Gradualness. The phrase Inevitability of Gradualness is a phrase that was coined by Sidney Webb, probably in small talk after the publication of his highly influential 1889 essay The Historic Basis of Socialism. In Historic, he went into detail about the importance of gradualness. Permeation is another ideological trait of Fabianism. Margaret Cole, one of the Society's historians, referred to this as "honeycombing". Cole explains that a combination of tracts, lectures, key groups and persons, who can be set in a position to either take direct action or directly influence others, is key to the success of the group's ideals. Key persons do not need to be Fabians themselves, and many times it is preferred that they are not members. Just so long as the sought after prize is attained. In this way, the person who represents the center of the honeycomb is surrounded by only the ideals that the Fabian want them to be surrounded with, which ensures the desired outcome. The Society's first historian, E. R. Pease explained permeation by quoting Ernest Barker's book "Political Thought in England from Herbert Spencer to the Present Day"
The policy of Fabianism has thus been somewhat as follows. An intellectual circle has sought to permeate all classes, from the top to the bottom, with a common opinion in favour of social control of socially created values. Resolved to permeate all classes, it has not preached class-consciousness; it has worked as much with and through Liberal 'capitalists' as with and through Labour representatives. Resolved gradually to permeate, it has not been revolutionary: it has relied on the slow growth of opinion. Reformist rather than revolutionary, it has explained the impossibility of the sudden 'revolution' of the working classes against capital: it has urged the necessity of a gradual amelioration of social conditions by a gradual assertion of social control over unearned increment. In addition to explaining the Society's views on permeation, the historian Barker also highlights the Society's high-brow, intellectual nature. Pease concludes the quoting of Barker this way: "'I have ventured to quote from Mr. Barker at some length because his summary of Fabian doctrine seems to me .... to be both correct and excellent.'". Bernard Shaw, one of the most important and readily identifiable members, was proud of how the Society used permeation to achieve its objectives. In Fabian Tract 41 "The Fabian Society: What it has done; and how it has done it." Shaw highlights how the Society's first major target for permeation, the Liberal Party, did not stand a chance. "We permeated the party organizations and pulled all the wires we could lay our hands on with our utmost adroitness and energy; and we succeeded so far that in 1888 we gained the solid advantage of a Progressive majority, full of ideas that would never have come into their heads had not the Fabian put them there"
Along with their viewpoint of evolutionary socialism, the Society's exclusivity is the second of two major disagreements with Marxist ideology. The Dictatorship of the proletariat is a major part of Marxism and pretty much any "worker" can join and be a part of "the cause", but Fabians are highly exclusive and upper class. In examining their early membership: Shaw, the Webbs, Pease, Podmore, etc., etc., they were all members of high society, well off, and highly educated. Shaw, Besant, Nesbit and others were all authors and academics and the Webbs were intellectuals. Others, like Hubert Bland were born into well-off families. Edward Pease noted that "W.L. Phillips, a house-painter, at that time the only "genuine working man" in our ranks." This exclusivity caused some consternation among the early Fabians with H. G. Wells publishing "Faults of the Fabian". Since its inception, the Young Fabians generally target college-educated youth. For the reasons of how the Fabians set their sights on well-off upper class members of society, some Marxists look upon Fabians as being a part of the proletarian class. The LSE was founded in 1895 by leading Fabian members Beatrice Webb (1858–1943), Sidney Webb (Lord Passfield) (1859–1948), George Bernard Shaw, and Graham Wallas. 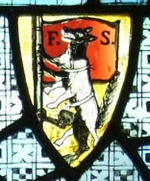 The Fabians have as their coat of arms, a wolf in sheep's clothing. It can be prominently seen in the Fabian Window which is housed at the LSE. Webb, Beatrice and Sidney Webb. Industrial Democracy (Originally published in 1897, link goes to 1902 publication), a highly influential statement by British Fabians. ↑ 1.0 1.1 David Fiorazo (2012). "10", ERADICATE: Blotting Out God in America. Life Sentence Publishing, 241–2. ISBN 978-1-62245-026-8. ↑ 2.0 2.1 2.2 2.3 (1961) The Story of Fabian Socialism. Stanford University Press. ISBN 978-1163700105. ↑ 3.0 3.1 3.2 (1962) Fabian Socialism and English Politics, 1884-1918. Cambridge University Press. ↑ 4.0 4.1 4.2 (1916) The History of the Fabian Society. ↑ (1993) Australia's First Fabians: Middle-class Radicals, Labour Activists and the Early Labour Movement. Cambridge University Press. ↑ The Rise and Fall of England: 11. The Fabian Thrust to Socialism. The Freeman (January 1, 1969). ↑ (2005) Fabianism and Culture: A Study in British Socialism and the Arts C1884-1918. Cambridge University Press. ↑ Podmore wrote: "For the right moment you must wait, as Fabius did most patiently, when warring against Hannibal, though many censured his delays; but when the time comes you must strike hard, as Fabius did, or your waiting will be in vain, and fruitless"
↑ (2000) Encyclopedia of British and Irish Political Organizations: Parties, Groups and Movements of the 20th Century, 942–943. ↑ (2007) Encyclopedia of Activism and Social Justice, 541–543. ↑ 13.0 13.1 (1889) Fabian Essays in Socialism. ↑ (2013) Slow Print: Literary Radicalism and Late Victorian Print Culture. Stanford University Press, 113–115. This page was last modified on 16 March 2019, at 19:41. This page has been accessed 28,137 times.